Helena Kazárová, Ph.D. specialises on the dance and movement culture of the past centuries both practically (reconstruction and re-enactement of the dances from written and graphic notation, choreography in the style of the chosen period, Baroque gestures) and theoretically (author of two books and numerous articles and studies . She graduated from the Academy of Performing Arts in Prague (Dance Theory and History), danced for some years as a professional dancer and then started to teach dance history, theory and aesthetics. Her theoretical research soon found results in practical reconstructions and presentations of historical dances and at first she concentrated on Baroque culture mainly. She studied and worked with international specialists in this field (B. Massin, M.-G. Massé, D. Wortelboer, E. Greene etc.) and especially with Marc Leclercq, with whom she collaborated on significant opera projects (Castor et Pollux of Rameau and Sub olea pacis et palma virtutis of Jan Dismas Zelenka) in the position of assistant of choreography. Since then, she has created and reconstructed many Baroque, Renaissance and Pre-Romantic dances for various prominent music and theatre festivals (Japan, Lithuania, Poland, Austria, Germany, Hungary) and also for ballet companies (Entrée d´Apollon of Feuillet and Pécour for National Theatre Ballet in Prague and Brno). From 1997 she is the artistic leader of the Hartig Ensemble – Dances and Ballets of 3 Centuries . For many years she works also with the singers and actors on the period acting techniques (gestures and stage movement) of the 17th and 18th century repertoire and some of the operas she has also directed. She collaborated with film and TV as a coach and advisor of period movement and choreographer (Interlude in Prague, dir. John Stephenson, Stilking Films - 2016, BBC 2 / Redgrave pictures document on Mozart´s Don Giovanni premiere in Prague Rolando Meets Don Giovanni with R. Villazon, dir. Guy Evans – 2014, The Skirt-Chasers of Jiří Menzel, This Hot Summer in Marienbad of Milan Cieslar, film Bathory of Juraj Jakubisko, etc.). She is a Professor at the Academy of Performing Arts in Prague, where she reads lectures on dance and ballet history, dance aesthetics and teaches early dances. She founded also the Association of Historical Dance in the Czech Republic and teaches at international summer academies, she is a member of the European Association of Dance Historians. As an expert and researcher on the Baroque, Rococo and early 19th Century culture she gave papers at many international conferences (most recently 2014 Stockholm University, 2013-15 Oxford University, 2016 Rothenfels, Germany, 2017 Dresden etc.). 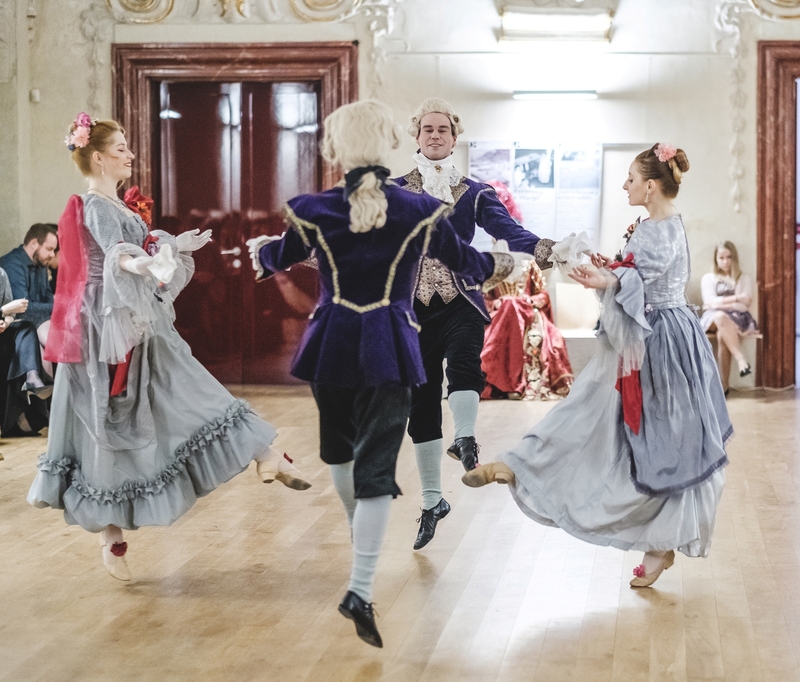 Hartig Ensemble is a chamber footloose company of professional dancers, who devote themselves to re-enactement of „dances of three centuries“ (that is dances from early Renaissance to Pre-Romantic era) under the artistic leadership of Helena Kazárová. The company collaborates very closely with Department of Dance of Academy of Performing Arts in Prague (AMU), housed at the Baroque Hartig Palace at Malá Strana (Small Quater) in Prague, and here the ensemble also rehearses. The repertory of the ensemble covers both the ballroom dances and the virtuoso theatre solos and duets from the 16th to the beginning of the 19th Centuries. As first in Czech Republic, Hartig started to study Baroque dances from the authentic sources - that is from the Beauchamp-Feuillet notation and soon reached the international professional level in this field. Hartig Ensemble is often invited to dance at experimental performances at the Baroque Theatre of Český Krumlov Castle and at other historical sites in Bohemia and abroad (e.g. Austria, Poland, Lithuania, Slovac Republic, Japan). Hartig performs with foremost Baroque orchestras (Musica Florea, Capella regia, Ensemble Inégal, Collegium 1704, Hipocondria Ensemble, Hofmusici and others) conductors and in case of chamber programmes also soloists (Edita Keglerová-harpsichord, Julie Braná-flutes and others). In special types of cultural venues, also recorded music is used. Since the year 1997, when Hartig ensemble was founded by Helena Kazárová, the dancers have been engaged, (in addition to their own concert programmes, e.g. Rendez-vous with Madame Pompadour), in many prestigious theatre projects. Let us name for instance the opera Castor et Pollux of J.Ph. Rameau (Estates Theatre in Prague), monumental work of J.D. Zelenka Sub olea pacis... (Wladislaw Hall of the Prague Castle) and most recently also the contemporary world premiere of the magnificient coronation opera Costanza e fortezza of J.J. Fux. Hartig Ensemble danced at to many festivals (e.g. International Music Festival Prague Spring, Dvořák Festival, Europamusicale, Europa-Mitte, Theatrum Kuks Festival, Bach Festival, Haydn festival, Smetanova Litomyšl Opera festival, Tanztage Bad Ischl, Barokowe Eksploracje and others). From the year 2007 Hartig Ensemble cooperates with Musica Florea orchestra and conductor Marek Štryncl on special projects, re-enactement of forgotten pieces like the Rococo ballet from Český Krumlov Castle archive La guirlande enchantée of Joseph Starzer, Gluck´s La Danza, Händels Baroque opera-ballet Terpsicore, Dioclesian by Henry Purcell and most recently the above mentioned opera Costanza e fortezza of J.J. Fux, tragic „ballo pantomimo“ of Gasparo Angiolini Didone abbadonata from 1766, opera Armida of Giuseppe Scarlatti (also 1766), and finally the only ballet of Ludwig van Beethoven Creatures of Prometheus, op. 43 from 1801 (premiered in 2016). Last programm was be devoted to Mozart (Mozartiana, 2017). Hartig dancers act also in film and TV productions: Bathory (Dir. J. Jakubisko), Hot Summer in Marienbad,(Dir. M. Cieslar), Roberto Villazón meets Don Giovanni (BBC-Redgrave Pictures, Dir. G. Evans), Story of one family opera (režie M. Suchánek), Princess and the Sribe (Dir. K. Janák), An Interlude in Prague (Dir. J. Stephenson) and they take part in various educational programs.